RMHCA Car Tags are READY! 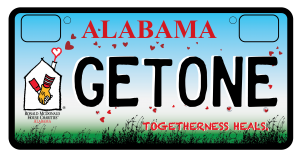 As of July 1, 2016, Ronald McDonald House Charities of Alabama’s specialty car tag is AVAILABLE! It has been a long road, but we are so happy that these beautiful tags are now out on the streets. You can stop by any state DMV or your local courthouse and ask for the RMHCA car tag to show your support for keeping families close. These car tags will cost $50, like all specialty tags, but $41.25 will come back to the charity. By getting your RMHCA car tag, you will be helping us spread the word about our mission to everyone you drive by! We are so excited to start seeing these on the streets and hope you will support us by getting one for each of your vehicles. Note: If you were among the first 1,000 to sign up for our specialty car tag, you should have received an email with verification from the state Department of Revenue office. 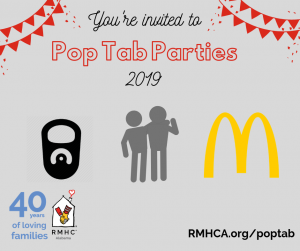 This email was sent to the address you provided, and will contain a receipt and a Commitment to Purchase Voucher for Distinctive Plates, which the registrant should present to their licensing official’s office for redemption of the free RMHCA specialty plate.